Mountain style Mexican food you can only find in Colorado. We take fresh, locally sourced ingredients & cook them the old-fashioned way: smoked, smothered, fire roasted or grilled. For large groups, private parties & catering options please contact jhouseman@littletonalley.com. 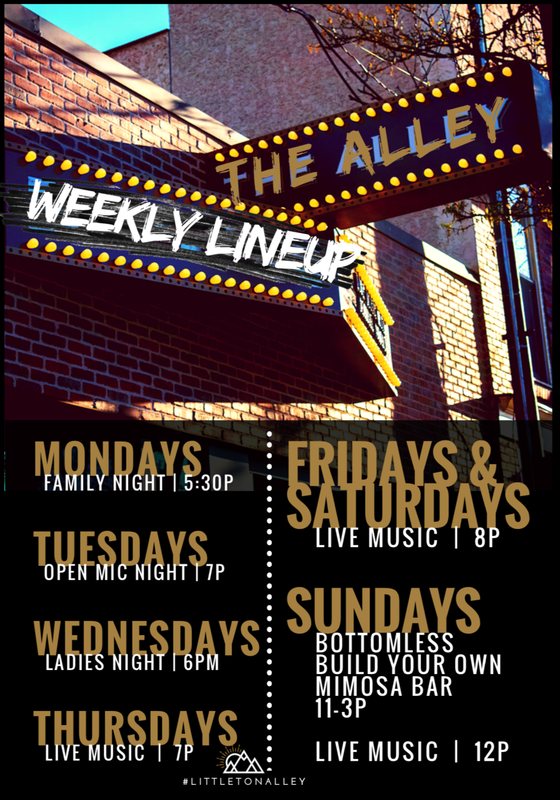 For live music booking information please contact cpearman@littletonalley.com. Owned and operated by Littleton natives with a passion for mountain style Mexican food & an emphasis on the different kinds of green chili the mountain west has to offer. The Alley's interior was designed to reflect the historic aspect Littleton takes pride in. The large mural on the wall of Mr. Richard Sullivan Little tells the story of a man who found his way to Colorado during the Gold Rush of 1859 and fell in love with the present day town of Littleton. Walk up to the truck and grab a quick meal or sit and let our staff serve you dinner and a handcrafted margarita in the back Alley encased in a festival like atmosphere. Your visit is not complete until you come inside our “Alley,” adorned with the old businesses of Littleton’s yesteryear, for a locally brewed craft beer. On winter weekends we will bring out our stage for good Local Music and from spring to fall we hold outdoor concerts in our back patio. Bienvenidos al Colorado!